When your kid has autism, communication breakdowns are an everyday occurrence. Communication problems are a common thread across the wide spectrum of autism disorders. Some people with autism are completely non-verbal. Others have limited vocabulary. Even those with a grasp of speech and language often have trouble reading social cues and carrying on a conversation. Words and sounds are sometimes used to communicate in rather non-traditional ways. My son, Rocco, does a variation of the Tarzan yell that can be quite an attention grabber, especially in supermarkets and shopping malls. He’ll change his pitch depending on his mood, so it is an expressive sound. But sometimes I think he’s making sounds to block out background noise, and help him focus on what he’s doing. Sometimes my son talks in code. He’ll say one thing, but mean another. Or he’ll say something that seemingly makes no sense. When he’s happy, he’ll blurt out the phrase, “Mommy’s feet!” When he’s unhappy, he’ll say “car book”, or “truck book”, or “sticker book”. He’ll use all three phrases in some situations, and only certain ones in others, but I haven’t quite unraveled the nuances of the appropriate use of each phrase. He wanted to go outside the other day, and I told him he had to wait. He looked at me and said, “sticker book.” I’m sure he intended it to mean something quite vulgar. I found myself explaining these things recently to various family members during our annual trip to the Jersey shore. Sharing a beach house with 10-20 people can be a bit overwhelming for anybody, but especially so for a kid with autism. Plus, Roc’s Tarzan yell is a way of life for my wife and daughter and I; it’s the soundtrack of our lives, and we barely notice it. But I imagine it’s probably irritating to others, especially those used to quieter living arrangements. 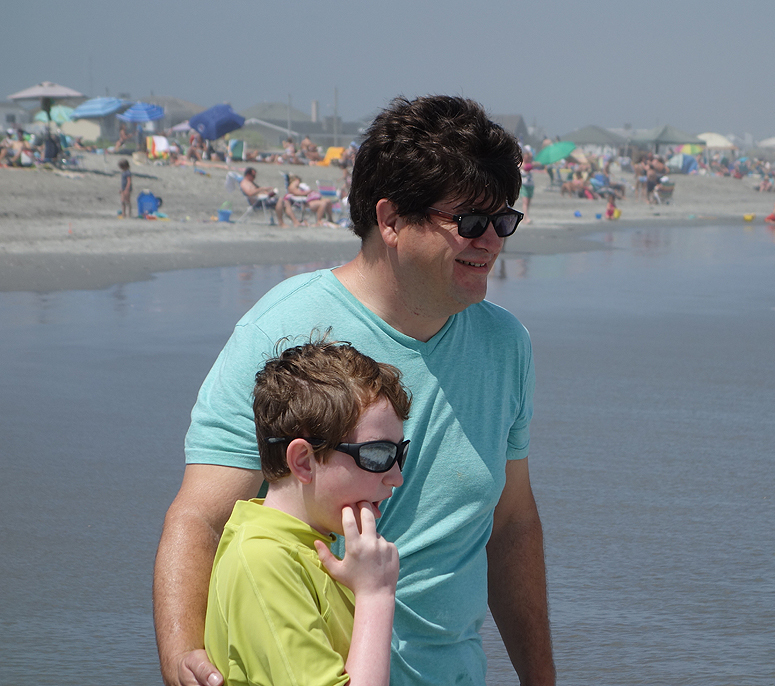 Hitting the beach with Rocco, July 2013. That’s another thing about raising a child with autism, or any special-needs child for that matter. Occasions that are supposed to be “fun” – like holidays and birthdays and summer vacations – are often a drag. They break the routine, set behavioral expectations that are often hard to meet, and they tend to underscore the developmental milestones your child’s missed, rather than the ones they have achieved. Birthdays can be especially difficult. Summer vacations are no picnic either. We’ve had some disastrous ones. When he was three, Rocco escaped from the rental house, and snuck down to the beach for a solo swim. We found him hanging out on the beach with a bunch of kindly strangers (angels) who had fished him out of the surf. The following year he had a meltdown in a public park. Another year, both my kids did so much damage to the rental house, Grandma had to find a different house to rent the next year. As much as I love seeing my Mom, my siblings and their families, there were some years when I couldn’t wait for our summer vacation to end. This year wasn’t one of them. My wife and kids and I all had a great time – we even stayed an extra day. The beach was a blast; the skies were blue, the sun was ripe, and the waves were just right. Rocco and I played in the surf. He greeted each crashing breaker with a squeal of delight. Imagine a prepubescent Tarzan learning how to ride a vine. We were drawing stares from our fellow beachgoers, but I didn’t care. We were having fun. “Daddy!” My son gripped my hand. Not because I didn’t understand him, but because I did, and it sounded so beautiful. I didn’t need a secret decoder ring to figure this one out. Sometimes the words are just right. When I originally commented We clicked your -Notify me while new comments are added- checkbox and now whenever a comment will be added I recieve four email messages with the same comment. Is there in whatever way you can get rid of me from that services? Thanks! Sorry, about that! I think I fixed it. We’ll find out the next time I post an update. Let me know, and thanks for the following our blog!